× If you are studying for your BAK or PPL exams and need some help, please post your question here. Someone on the forum is bound to help you as soon as they can. Would you mind checking the answer in the screenshot below? Struggling to work out how I got this wrong. There's a subtle wording in TEM questions that can trip you – it certainly did during my study! •	The stall warning device is indeed a Systemic Counter-measure that aims ensure proper pilot actions. 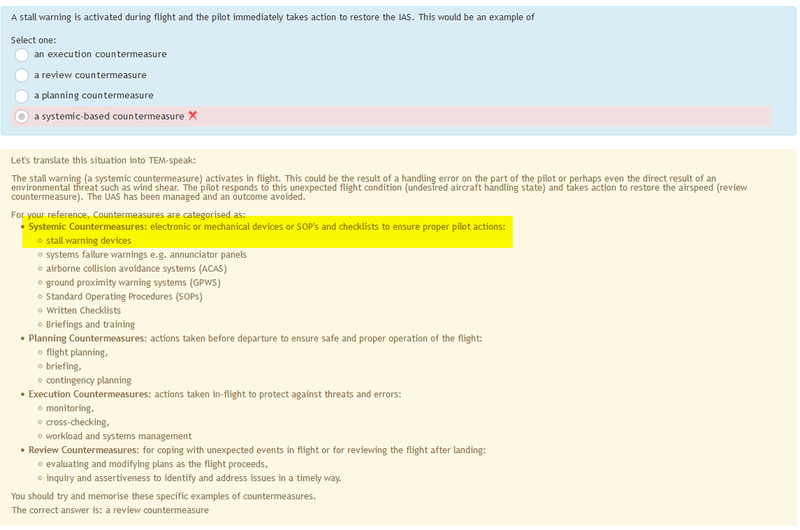 •	The activation of the stall-warning means the aircraft is in an undesired state (particularly if its unexpected). •	The pilot corrects this undesired state (which they discovered through the stall warning) through a proper recovery action - that action is a review-counter measure in TEM lingo.